Our study identified key criteria to pinpoint those buildings that are most likely to experience leakage. A new study from the Center for Energy and Environment (CEE) examining the viability of duct sealing in commercial buildings, revealed several criteria that could be used to help identify buildings most likely to realize significant energy and cost saving benefits from duct sealing. These criteria include system type, operating pressure, design flow and apparent tightness. 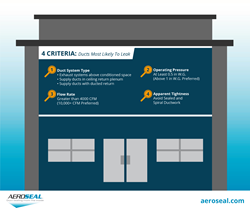 The study also concluded that aerosol-based duct sealing proved more effective and produced a faster return on investment (ROI) as compared to traditional duct sealing methods, particularly when access to ductwork was limited. Highlights of the study "Duct Leakage and Retrofit Duct Sealing in Minnesota Commercial and Institutional Buildings" were presented by CEE Senior Research Engineer, Josh Quinnell, Ph.D., at an Aeroseal LLC-sponsored webinar held earlier this month. Apparent Tightness: Systems with existing sealant and systems of apparently tight construction (spiral, flanged & gasketed ductwork) are less likely to have substantial leakage. The study also found that aerosol-based duct sealing was typically more effective than traditional duct sealing (tape / mastic), especially when the ducts were insulated or access to the entire duct system was limited. For more information on the CEE study visit https://www.mncee.org. Visit http://bit.ly/2sM2MRd for access to the infographics. For a copy of the full report, visit http://bit.ly/2BFcuUD. For information on aeroseal technology visit http://www.aeroseal.com.